Quill sign painting brush. I use several brands including Andrew Mack, Luco and French Masters. I have been able to do a lot of lettering and graphics with a quill. It is the king of sign painting brushes, because it is the most versatile. I can achieve fat strokes to fill in a letter, thin strokes to outline a letter and a fine point for tiny details. There are a few other brushes out there, including flat and liner brushes. For lettering, you can use a quill to paint script, casual and block styles. 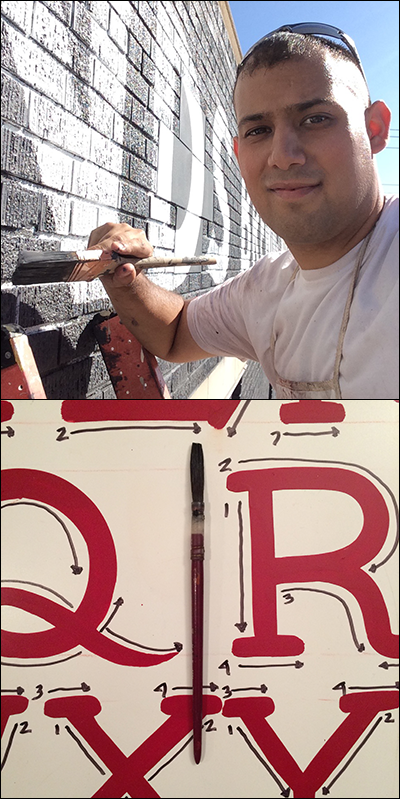 In my opinion, it would be harder to paint those alphabets with a flat or liner, but every sign painter is different. If I could only have one brush, it would be a quill. Images courtesy of Alex Mendoza.